Monday, March 30th, we finalized the purchase of 408 E 8th Street in Washington. Thank you to our private financer, and to everyone who has pledged support to the campaign already! In a variety of ways, many of you have already planted and watered seeds of faith – that was your commitment to the Lord and His people at New Life when you began attending. Now we are presented with an opportunity as a young church to take another step forward in our ministry. The good news is that, yes, we are invited to plant and water seeds of faith, but we do not go about it alone. The Lord who called us to plant New Life Church, the One who called each of us to be a part of New Life’s ministry, promises to bring about a harvest from our labor. And such begins with our planting! Your seeds of faith don’t simply go toward paying off “bricks and mortar”, they will ensure that seeds of faith are planted and watered in the hearts of the next generation as ministry occurs in the facility; your “seeds” will also make room for those who step forward at New Life wanting more of what the Lord offers those who earnestly seek Him. This begins with your, and my, planting. How can you “plant”? A pledge card is linked below, on which you can prayerfully and passionately list your “seeds”. By Sunday, March 21, we had received nearly $25,000 (plus an additional $11,000 in pledges)! Yeah God! We only needed to borrow $175,000 for the closing! Thank you for your prayers and your generosity. 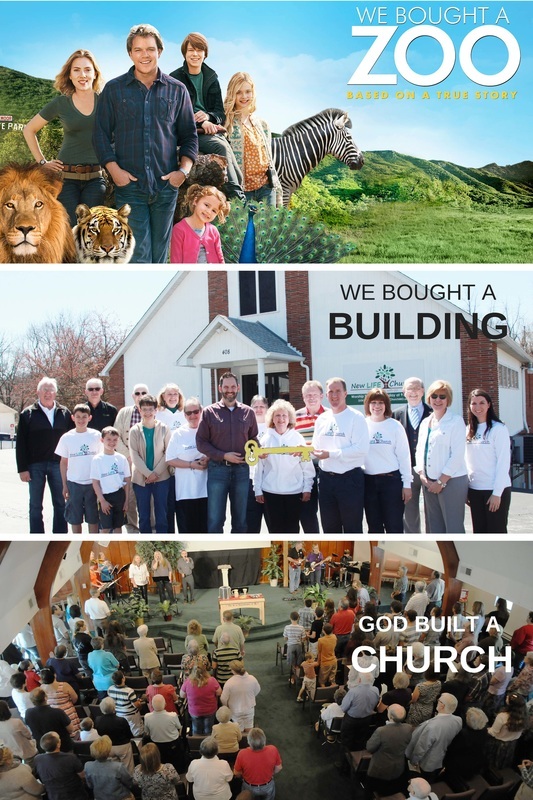 Jean Webb said once that this whole church-planting adventure reminded her of the movie, "We Bought a Zoo!" What a blessing this adventure has been. We've been able to see God's hand at work at New Life Church and it is amazing to be a part of it. Are there times when we wonder how it will all come together? Of course... But somehow, God keeps showing us that His plan is far greater than anything we could dream up!